When I was little-bitty, I was allowed to walk down the street, in Falkville, Alabama, to Big Papa’s cotton field, where I played at picking cotton with people who were not playing. Big Papa was my great-grandfather. The cotton pickers, women with scarves on their heads, bent low down the rows. This is my third oldest memory. I might have been four years old. 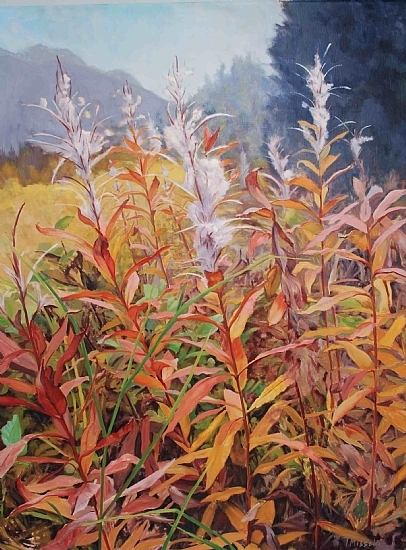 This afternoon, in Homer, Alaska, the cotton of fireweed dances in the air, unpicked, planting its own seeds. Some have stuck to my arms and hands that are nearly 68 years old. For a while, the fireweed cotton blew west; now it’s to the east. I’ve heard that snow comes six weeks after fireweed cottons, but this year a warmer July prompted early bloom.